We are in a motel again in Jackson tonight. [flush toilets, showers] We plan on camping in Teton tomorrow. Today, we entered Teton as day campers and hiked the Taggart and Bradley Lakes trails. These are two alpine lakes at the base of the mountains. It was on Taggart that we spied the avocets. They are rare in these parts. The ranger didn’t even know what they were, but from all my visits to Monterey, I recognized them and iBird confirmed me. Unlike in Monterey, they were in breeding plumage here. 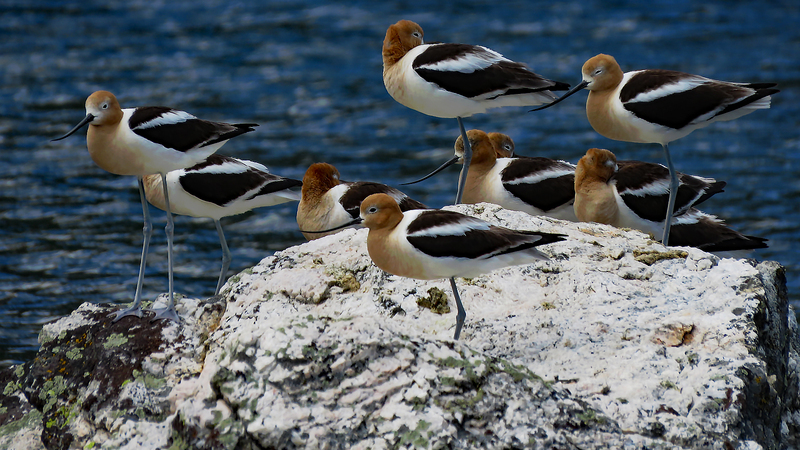 The correct name for a flock of avocets is a colony. Maybe this seemingly lost group of birds are actually explorers?